Across the country, nearly one in five children will struggle with hunger this year, according to Share Our Strength. That’s more than 16 million children in the U.S. who do not get enough to eat. In DC alone from 2009 to 2010, 37.4 percent of households with children said they couldn’t afford enough food, according to DC Hunger Solutions. 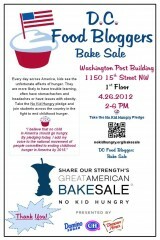 To help drive down these statistics and child hunger, some of the DC bloggers are hosting a bake sale today as part of Share Our Strength’s No Kid Hungry campaign. All you have to do is stop by and purchase some baked goods to help a good cause. It’s almost time for another DC foodie favorite event, and also one of my favorites. DC’s strong culinary community will be joining forces yet again to fight childhood hunger with Share Our Strength at the 23rd Annual Taste of the Nation. More than 75 of Washington’s favorite chefs, mixologists, restaurants and wine bars will come together to raise money and awareness for “No Kid Hungry” Share Our Strength’s campaign to end childhood hunger by 2015.